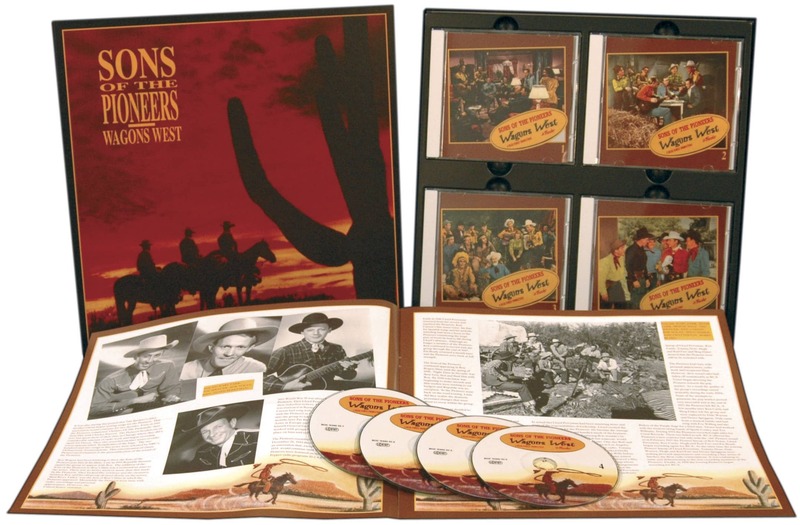 4-CD boxed set (LP-size) with 23-page book, 114 tracks. Playing time approx. 315 mns. Riders In The Sky. Backing musicians include Hugh and Karl Farr, Noel Boggs, Joacquin Murphey, and Jimmy Wyble. The last word on the first name in western harmony! 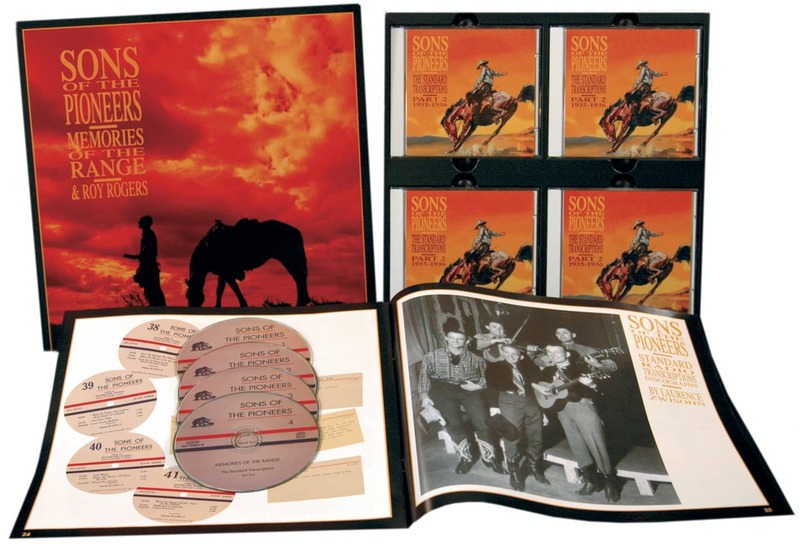 Like a braided river the careers of Roy Rogers and the Sons of the Pioneers flow together, mingle, separate, reunite, diverge, and recombine with the flow of years. Each has secured places of lasting honor in the history of American music, recording, songwriting, and cinema, yet they are forever associated, forever united, in our collective memory. 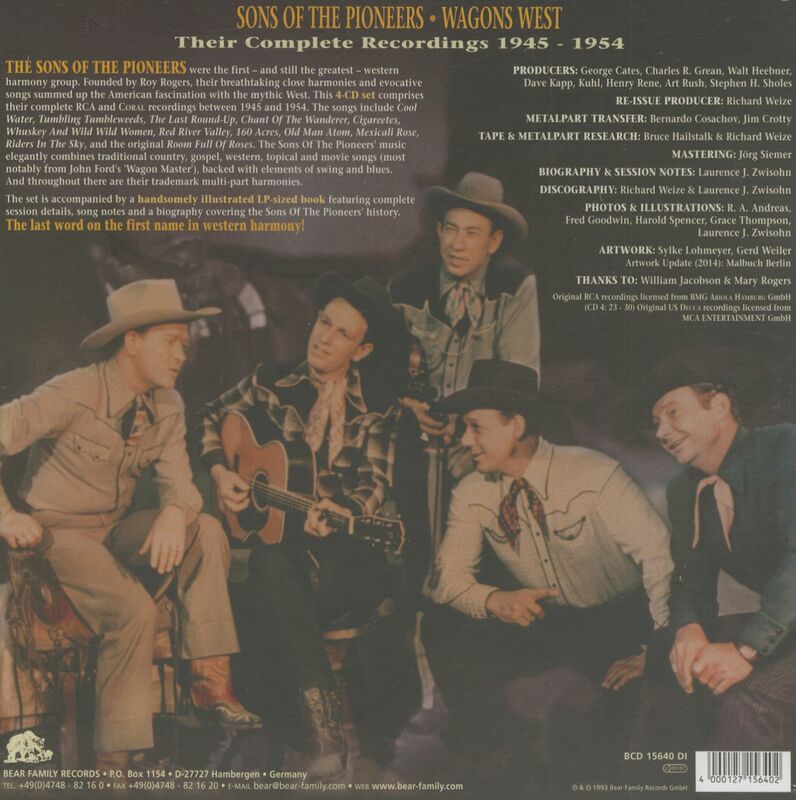 The complicated history of the Sons of the Pioneers, with and without Roy Rogers, has been well covered in other Bear Family releases of their music, but an overview is useful in this collection, which celebrates their entire commercial recording oeuvre before the World War II recording ban. 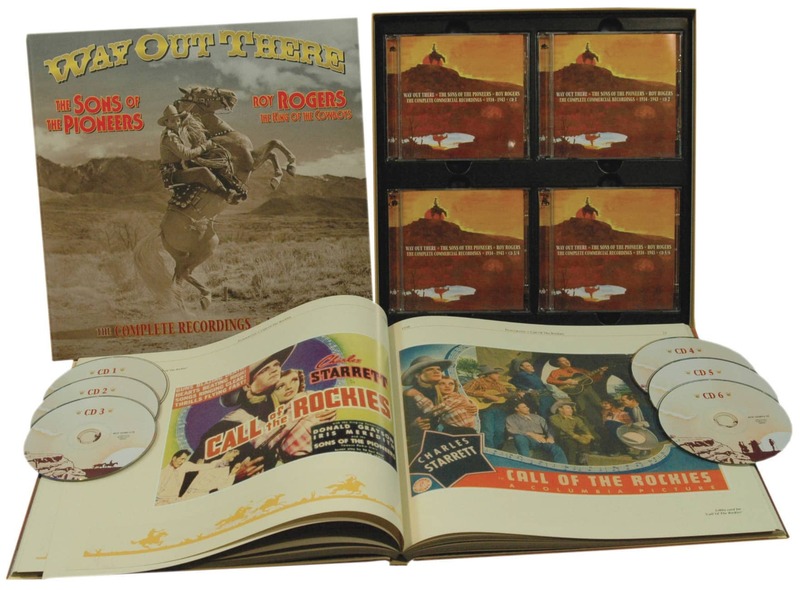 Many postwar Pioneers have long been represented in Bear Family collections, and it is hoped and planned that the postwar Roy Rogers recordings will, in time, be released in a multidisc set; there are also many fine Pioneers recordings from the late 1950s and early 1960s yet to be re-released. Here, for the first time, are collected all their remarkable early recordings--including alternate takes--that clearly demonstrate their burgeoning talents and growing confidence as they shaped what was to become the clearly definable sound of western music. At the same time, we can trace the parallel growth and development of the art of Roy Rogers, who was to become one of the handful of iconic figures in American film and popular culture. Together, and separately, they were giants, and it is our privilege to witness the growth and flowering during the years of the Great Depression and the coming of the Second World War. I. A Brief History, Part One. Though as rocked by the hardships of the Depression as any other part of the country, Los Angeles was nevertheless a hotbed of musical energy in the early 1930s. Financial gloom hanging over every American family made the free and easy life of the cowboy an enormously appealing fantasy. Western films were coming back into vogue, some--Ken Maynard's primarily--featured music as an integral part of the story. 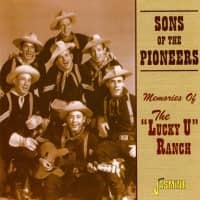 Western songs like Home On The Range and The Last Roundup were popular with record buyers and western bands flourished on the radio, nowhere more so than in Southern California. The appeal and glamor of western films brought youngsters from all over the country, hoping to make marks as singers, songwriters, actors. And among them were the three youngsters--Bob Nolan, Tim Spencer, and Len Slye--who would make up the Pioneer Trio, and also among them were the other young men who would later join what became known as the Sons of the Pioneers: Lloyd Perryman, Pat Brady, Hugh Farr, Karl Farr, Ken Carson and the rest. 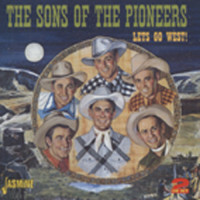 The market for western music in those early days was large enough to support a number of entertainers, yet small enough that most musicians were familiar with each others' talents, and a number of band shifts, replacements, and bands within bands allowed for the mixing and matching of voices, talents, and personalities that eventually became the Sons of the Pioneers. Bob Nolan was the first of the trio to try to conquer California. Born Clarence Robert Nobles in Winnipeg, Manitoba, on April 13, 1908, his father Harry separated from his mother early in Bob's life, and bounced around Canada and then Boston, Massachusetts, before moving to Tucson, Arizona, where he moved his boys Clarence and Earl (1911-1991), a three sport athlete at the University of Arizona and later a professional football player and boxer, around 1921. Upon his discharge from World War I Harry Nobles changed his name to Nolan, and thus young Clarence Robert Nobles in time became Bob Nolan. Clarence's voyage by train from Boston to Tucson first introduced him to the desert, and the dreamy and imaginative teen began to write poetry, and later songs, based on the endless awe inspiring beauty he found in those trackless barrens. Through high school he studied the art of Shelley, Keats, and the romantic poets, and their echoes can be found in many of his later songs. More importantly, he came to capture more vividly than any other poet the changing, haunting vision of the west, focusing not on the harsh realities of cowboy life or of love lost but the beauty of the west itself. 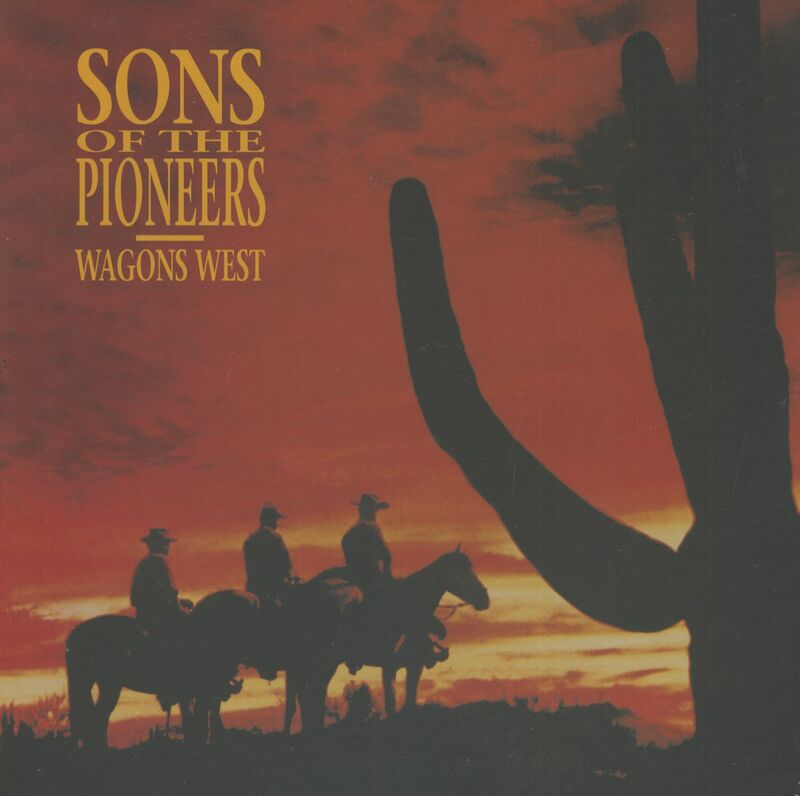 Customer evaluation for "Wagons West (4-CD)"
Vor kurzem habe ich mir endlich die CD-Boxen "Wagons West", "Memories Of The Range" und "Way Out There" der Sons of the Pioneers zugelegt. Das ist wirklich Country-Music vom Allerfeinsten! Ganz große Klasse!